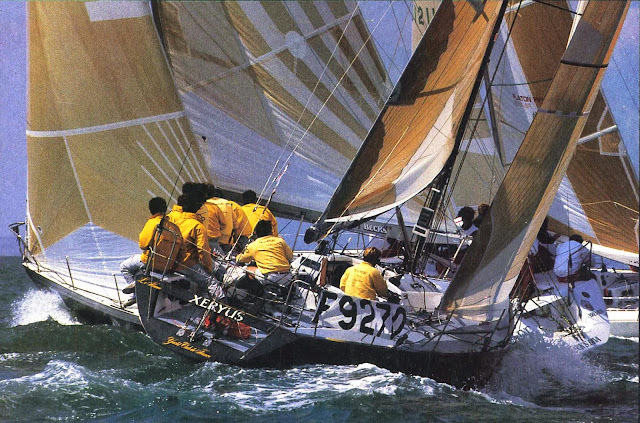 These photos follow my earlier post about Librah and the New Zealand campaign to defend the Admiral's Cup in 1989. 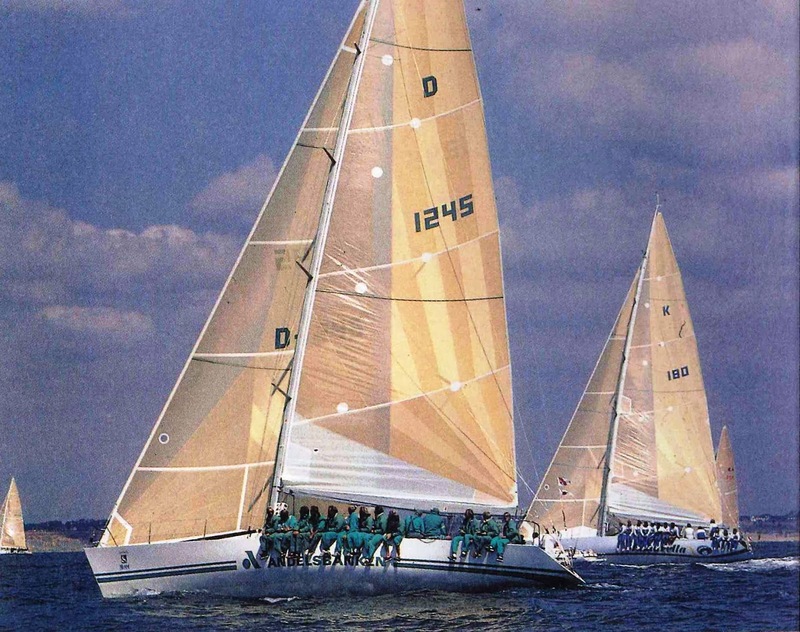 For the 1989 series the Royal Ocean Racing Club had resolved to reduce the previous hegemony of the One Tonners by changing the time multiplication factor (TMF) in favour of the 50-footers, and to reduce the points loading for the offshore regattas. 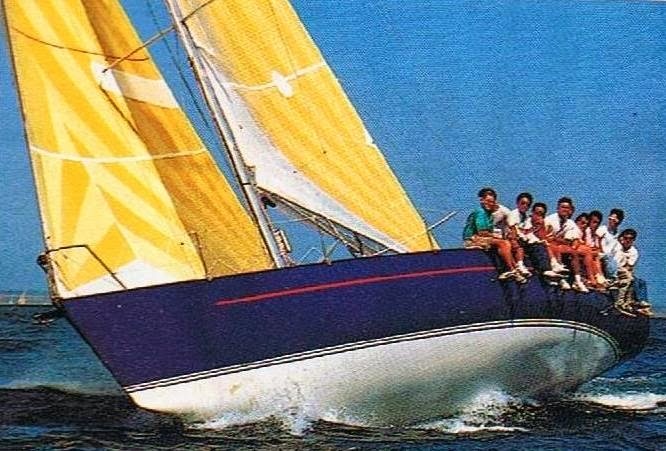 Meanwhile the burgeoning 50 Foot class had undergone further development with the advent of its own dedicated World Cup circuit, essentially becoming scaled-up One Tonners - the change to the TMF and performance gains by the 50-footers was considered to represent something like a 20-30% improvement relative to 1987 generation yachts. 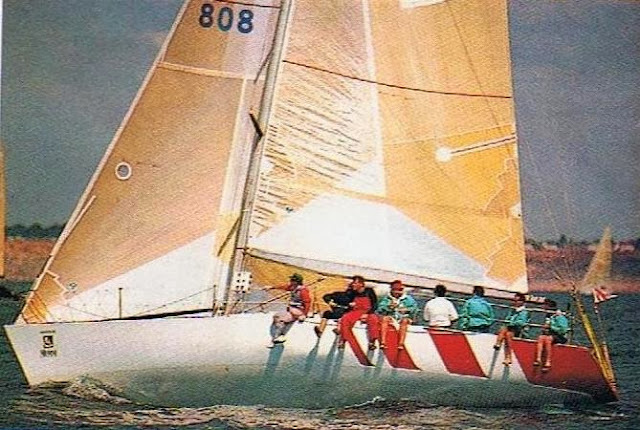 1989 thus became the year of the 50-footers, with the new breed of these Admiral's Cup 'maxis' leading to line and handicap wins in five of the six races, and taking the four of the top five places overall. 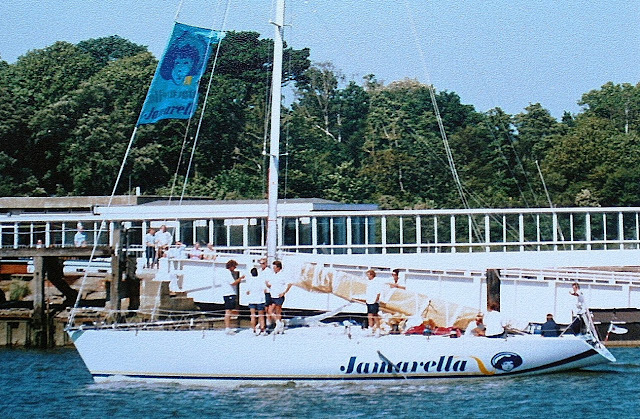 The Farr 50 Jamarella, owned by Alan Gray, led the charge for the British team (alongside the Castro 45 Juno IV and the Andrieu One Tonner Indulgence VII) with a superbly consistent 1/3/2/3/2/4 series that made her top individual performer in the 42-boat fleet (from 14 nations), and spearheaded Britain's first cup win since 1981. 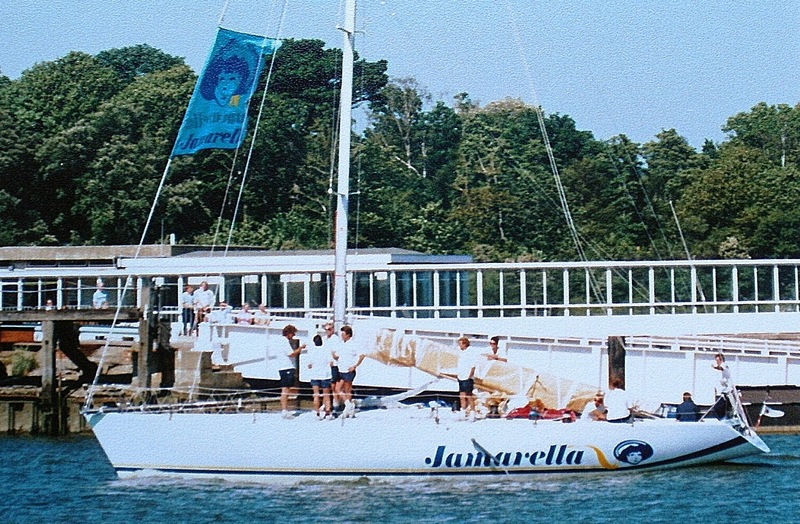 Gray built Jamarella expressly to compete in the newly established 50 Foot World Cup circuit and because he felt that the TMF changes could allow a 50-footer which was not just a useful team yacht but potential series top scorer. 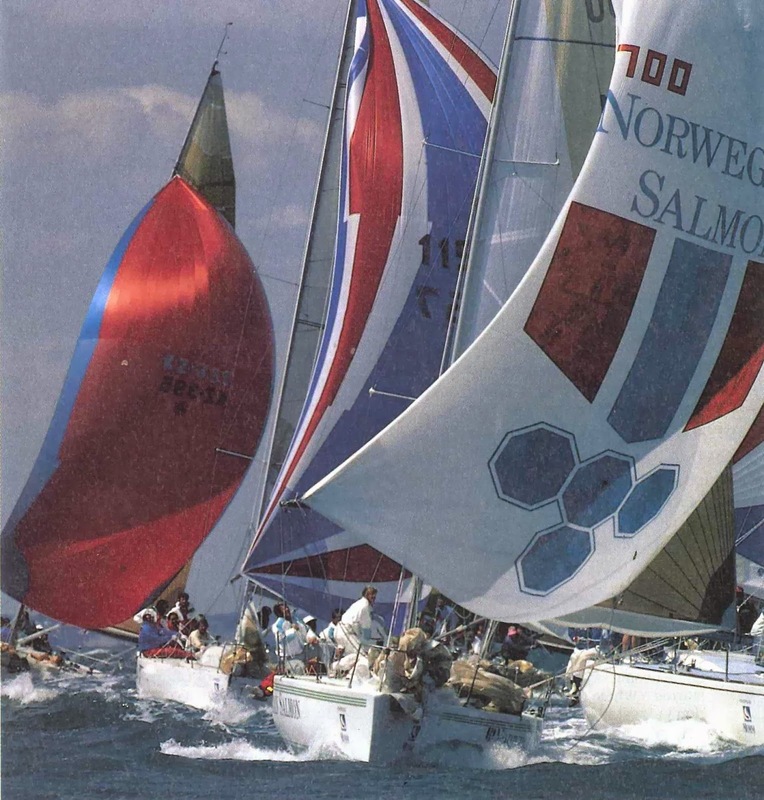 "Bruce Farr, Morgens Brinks (the Danish manager) and myself were the only three people in the world who thought a 50 could do it" claimed Gray at the end of the series. 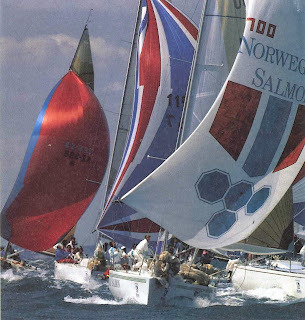 Denmark had realised the potential of the 50-footers early and were quick to secure the German 50 Container in its team alongside Andelsbanken IV - this was a potent combination (along with their Farr One Tonner 4K) that nearly secured Denmark's first ever win in the series. 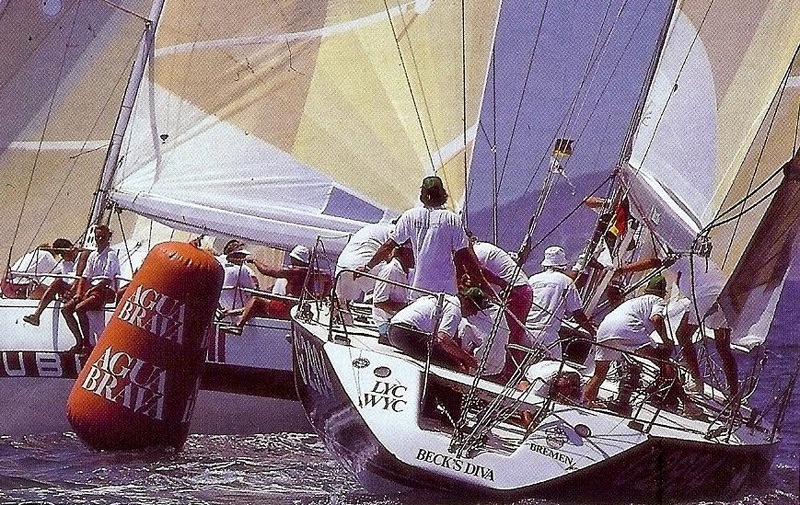 However, the loss of Andelsbanken IV's forestay in the fifth race saw the team drop to second place overall. 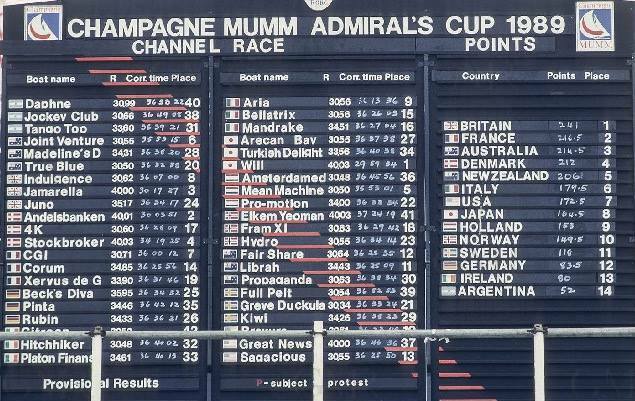 Unfortunately, the new emphasis on these Admiral's Cup 'maxis' did nothing for the affordability of the Cup for many countries. However, the vagaries of determining what mix of boats were best for future campaigns was addressed by establishing new rules for the composition of teams for the 1991 event, with a requirement for teams to field a One Tonner, a Two Tonner and a 50-footer, and results would be scored within each class. "French yacht Xeryus De Givenchy, a Farr 44, finished in 24th place (the French team finished fourth over all"
Nevertheless, B. Trouble and his crew had never time enough to fit the boat and sail it as well. This Farr design was very fast and easy to hand, but she never took time to prove it !!! Richard Blakey 2012. Powered by Blogger.